Dance mask, ca. 1916–18. Hooper Bay, Alaska, Collection of Charles and Valerie Diker (788) © Charles and Valerie Diker Collection. Earlier this month, the Metropolitan Museum of Art in New York announced that Charles and Valerie Diker have made a gift of 91 masterworks to the museum from their collection of Native American art. The objects will be exhibited in the American Wing of the Met, starting in the fall of 2018 – the first time that the Met has placed an extensive collection of Native American objects “within their geographical context.” Past exhibitions of Native American objects have primarily been displayed ethnographically at the Met, within the Arts of Africa, Oceania and the Americas galleries. 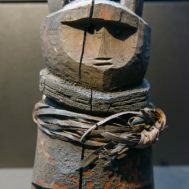 In most museums, the creative works of indigenous peoples are rarely brought into the main galleries or granted the prestige of ‘works of art.’ Such items are most often displayed in an ‘ethnographic’ context, or in separate galleries dedicated to ‘decorative art’ or ‘craft’, depending upon the medium of the works. 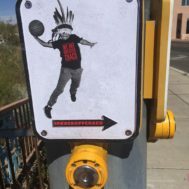 (It must be also said that some Native peoples object to calling objects ‘artworks’ if they are traditional creations or have meaning as ceremonial objects.) At least in the museum world, having a place in the main galleries is a form of recognition, signaling acceptance into the pantheon of the art world. Charles and Valerie Diker are experienced collectors, well-versed in Contemporary and Modern art, and knowledgeable about the aesthetics of color, shape and design. The Dikers began their relationship with Native American art on a visit to Taos, New Mexico over 40 years ago, when an intriguing American Indian basket caught their attention. 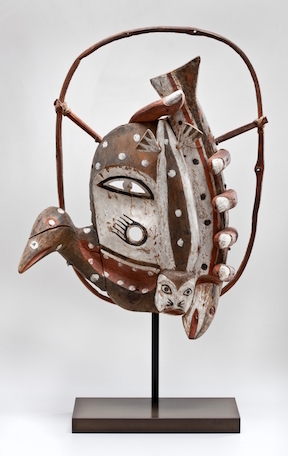 Over the years, the Dikers’ Native American collection expanded beyond the Southwest to encompass all of North America, with artistic representation from many tribes and pueblos, and including works from the pre-Contact era to the 20th century. The Diker collection is often considered to be the most comprehensive and refined of any private collection of its kind. The Dikers have been involved with The Met since the 1990s, as donors and lenders from their collections. They have given over 20 items to the permanent collection and shown their Native American artworks in multiple exhibitions beginning with Native Paths: American Indian Art from the Collection of Charles and Valerie Diker from 1998-2000. Last year’s touring exhibit, Indigenous Beauty: Masterworks of American Indian Art from the Diker Collection, also reflected this element of the Dikers’ vision, emphasizing the artistry and aesthetic qualities of the individual works, rather than focusing on historical and cultural context. The recent show at the Met, Native American Masterpieces from the Charles and Valerie Diker Collection (October 28, 2016-March 31, 2017), followed a similar vision as Indigenous Beauty, although it was not connected with American Wing. The exhibit stood alone, showcasing the artistry of its Native American creators. This is the first time that an artistic dialogue will take place on such a large scale between the masterworks of the Diker collection – or any collection of Native American works – and the American Wing of the Met. A geometrically woven Pomo basket from California sits on a stand to the left of Jules Tavernier’s “Dance in a Subterranean Roundhouse at Clear Lake, California,” bringing an object from the same tribe and time period as depicted in the painting together into the viewer’s vision, allowing a deeper connection to the scene. A starkly black ceramic olla by Tewa potters Maria and Julian Martinez from Po-Woh-Geh-Owingeh (San Ildefonso Pueblo) New Mexico invokes a relationship – of nature and form – with the black mesa central to Ernest Blumenschein’s painting “Taos Valley, New Mexico,” a site just 75 miles away. The relationship between art and history in the American Wing of the Met was reinvented with the Wing’s makeover in 2012 and may have paved the way for the integration of the Diker Collection. More than aesthetics may be considered when integrating Native American objects within the American Wing of the Met. There are layers of artistic, historical and cultural perspectives inherent to each object. The Met stated in its press release that “the Dikers have been ardent and generous supporters of a broad range of cultural institutions across the visual and performing arts.” Most notably, in the context of their collection of Native American Art and donation to The Met, Mr. and Mrs. Diker have served as the Founding Chairman and Chairwoman of the Smithsonian’s National Museum of the American Indian, George Gustav Heye Center in New York. The Dikers’ generous gift has given the Met a unique opportunity to bring an understanding of history and to reflect on the varieties of artistic expression and the significance of cultural context together in this new and important element of the American Wing. *The similarities between the two shields aptly illustrate the extraordinary potential for confusion and prosecutorial abuse inherent in the proposed STOP Act. See Two Dangerous Bills Fail: STOP and TAAR Die in Committee.